Here is the Pacific Theater like never before! Advanced Pacific Theater of Operations is the most comprehensive Pacific Theater World War II game ever published, encompassing the entirety of the war in the Pacific. From the Japanese invasion of China in 1937 to the end of the war on every front, the Entire Pacific conflict is now portrayed with amazing accuracy. Like Advanced ETO, the forces and combat units in Advanced Pacific Theater of Operations are exactingly accurate and have been exhaustively researched. There is no guesswork here; absolutely every game piece is based on the most thorough study ever devoted to a Pacific Theater game, even borrowing data from the incredibly precise War in the Pacific by Decision Games. As a matter of fact, Advanced PTO is more extensive yet, even featuring all of the Soviet and Japanese forces engaged during the "Nomonhan Incident", plus the forces and combat units of every nationality that fielded a military (even the Burmese) during World War II. Indeed, Advanced PTO is actually a division-level game, and is even more detailed than the acclaimed Advanced ETO. Yes, Advanced PTO features all the detail of Advanced ETO. In fact, both AETO and APTO can be linked together to simulate the entire Second World War more accurately than any other game ever produced. 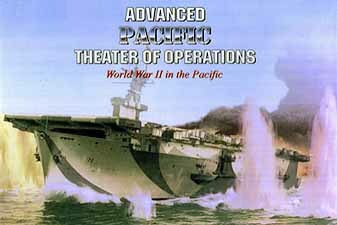 But Advanced PTO is more than an AETO supplement: featuring special rules for everything from Elite Pilots to Atomic Bombs, from midget submarines to coastwatchers, even a rule simulating the effects of tropical diseases, Advanced PTO is a Pacific Theater game unlike any other. Without doubt, Advanced PTO is the most realistic game on the subject; it includes new admirals and generals, virtually every type of aircraft, every capital ship that existed in the Pacific Theater (even the lesser-known vessels, such as the USS Utah, and even some naval refits (such as the USS Intrepid's upgrade from F4Fs to F4Us.) Advanced PTO is the ultimate blend of playability and detail. In conjunction with AETO (and also Africa Orientale Italiana, the East Africa expansion for AETO and APTO), no World War II strategic game series has ever been this all encompassing, detailed, playable and realistic all at the same time.